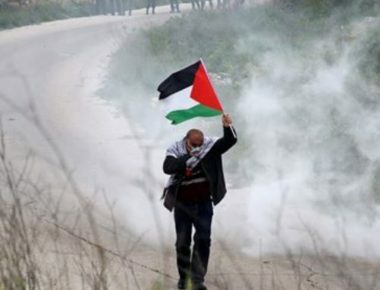 Israeli soldiers resorted, Saturday, to the excessive use of force against nonviolent protesters marching in condemnation of the ongoing Israeli violations against medics, near Huwwara roadblock, south of the northern West Bank city of Nablus. The soldiers fired a barrage of gas bombs and concussion grenades at the protesters, causing dozens to suffer the effects of teargas inhalation. Various political factions and social organizations in Nablus governorate have called for the protest near Huwwara roadblock, due to the escalating deadly Israeli violations against Palestinian medics, including the latest casualty, Sajed Mizhir, 17, a volunteer medic with the Palestinian Medical Relief Society, who was killed by army fire, after the soldiers invaded Deheishe refugee camp, south of Bethlehem, last Wednesday, March 20th. In related news, the soldiers injured several Palestinians, during protests marking the Palestinian Land Day, at the northern entrance of al-Biereh city, in the central West Bank governorate of Ramallah and al-Biereh. In the Gaza Strip, the soldiers killed one Palestinian, identified Mohammad Jihad Sa’ad, 20, and injured several others, including medics.